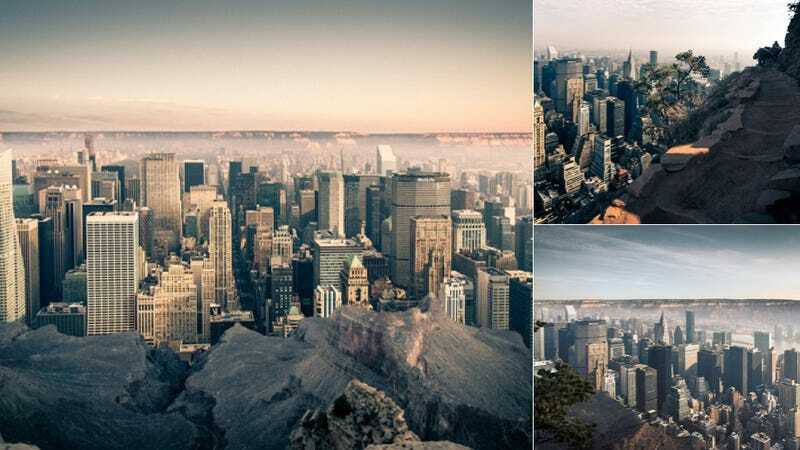 What Would Manhattan Look Like If It Were Inside the Grand Canyon? Suspend disbelief for a second and imagine if the Big Apple were dropped inside of one of the biggest canyons in the world. It would be an amazing, vast, and otherworldly mashup of two opposite places, as demonstrated in a series called Merge by photographer Gus Petro. In the end of 2012 I travelled to USA to experience something new. And it was something I didn't expect: emptiness and density. 'Merge' is the last part of a project series 'Empty, Dense, Merge' which explores two opposite feelings through the photos of places located in USA. In this project two opposite places are merged into one: New York City, where, it seems like, everyone wants to live there, and Grand Canyon / Death Valley, which are unlivable.